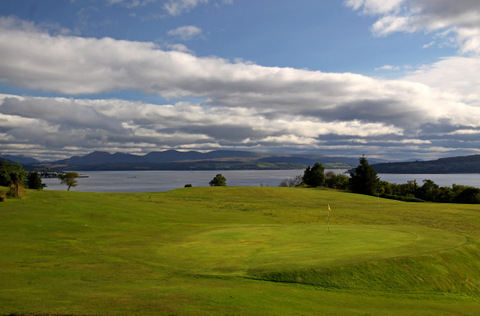 The course was opened in 1891 and remains more or less as it was designed 125 years ago. The course has a Standard Scratch of 64 from the medal tees and is a combination of longish par 3s as well as tricky par 4s. The signature hole must the 6th, aptly named Rubicon. It is a long par 4, over 400 yards and the longest hole on the course. It requires a good drive as it has out of bounds all down the right side of the fairway. The Rubicon burn runs across the fairway and would require a drive of 250 yards to carry. Most players lay up, leaving a long fairway shot to the green of over 200 yards, uphill to a raised green. A par here is seen by the members as being as good as a birdie. The final hole is a tricky par 4 running back up to the front of the clubhouse. An accurate second shot is needed to hold on to the small raised green, often either playing directly into the setting sun or a stiff south westerly. An excellent finishing hole made more difficult as your final putt may well be in full view of fellow members on the clubhouse verandah.